Here's something that you don't want in your bedroom so you better make this a mantel clock, the Tyrant Alarm Clock. This is a concept clock by Alice Wang and instead of blasting off loud sounds to wake you, it hijacks your contacts on your mobile phone and randomly calls someone. It does the calls every three minutes so I guess you're forced to get out of your bed lest you want to call your mom so early in the morning. Nice Concept. 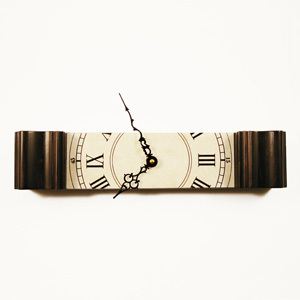 For those of you who want something a little more traditional, say grandfather clocks traditional, how about just a slice of a grandfather clock? Really, it's just a SLICE. This slice of a grandfather clocks is perfect for those still caught between going traditional or modern in terms or designing their room.